Yesterday I wrote about The Unchanging Face of Grief, and how a journal entry I wrote exactly three years ago mirrored what I was feeling — Just drifting. Marking time. Hoping . . . But the truth is, there is a vast difference between yesterday’s feelings and those of three years ago. Three years ago, when I wrote that entry, I had accomplished most of what I needed to do immediately after the death of my life mate/soul mate. I had him cremated as he wished, opened a new checking account, disposed of most of his effects and a lot of “our” things that weren’t worth storing, got myself to my father’s house to look after him since he could no longer live alone. There was nothing I needed to do, that day three years ago, and the great pain of grief provided insulation from the normal irritations and aggravations of life, offering me the illusion of freedom. I just drifted in a fog of pain, spending hours in the desert, thinking not much of anything. Just wandering. Marking time. Hoping my life was actually going somewhere and wouldn’t always feel so stagnant. People often talk about the “stages” of grief, as if grief were a staircase you ascend, step by agonizing step, until you climb out of the pit, but grief is more like a spiral that slowly unrolls, returning you over and over to the same places, each time with a bit less pain and emotion. At the beginning, these changes from vast pain to numbness, from despair to hope, from determination to helplessness come so quickly, it’s as if you’re inside a slinky that some over-active child keeps tossing around. You don’t even have time to acknowledge one state of mind before you’re in a different state. My spiral of grief is still unrolling, but now, after more than three years, the changes come slowly and have little power. And the upsurges of angst are over quickly. But this feeling of waiting, of stagnation, seems to be ever present. I don’t seem to be going anywhere with my life. I remember at the beginning, I was anxious to be done with my grief so I could embrace my new life with arms outstretched. I expected wonderful things to happen, and why shouldn’t they? Doesn’t it make sense that great happiness should come to balance out such great pain? But here I am, long past the worst of my pain, and I still seem to be running in place. (I’m pretending this thought came from him in response to my complaints, but more probably it came from my subconscious.) Doing what I want is easy. Figuring out what I want is hard, but maybe someday it will come to me as I wander. Another revelation, that I’m not sure I understand, is that life is a tool that we write with, much as we write with a pen. I’m still thinking about that one. Despite the feelings of going nowhere, I am still trying to keep open to “somewhere.” Still trying to embrace life. Still trying . . . I love your writing, so visual and evocative…the image of you wandering in the desert asking for answers, complaining, thinking, listening. Is that picture of Joshua Tree/Twenynine Palms? If not, looks just like it! I believe the answer to “what do I want” will come to you one day. It’s so hard to re-envision our lives without the loved one we lost, but perhaps the answer is already inside us, in some childhood memory or dream we once had. Life as a tool we write with is a very deep and wonderful thought indeed. 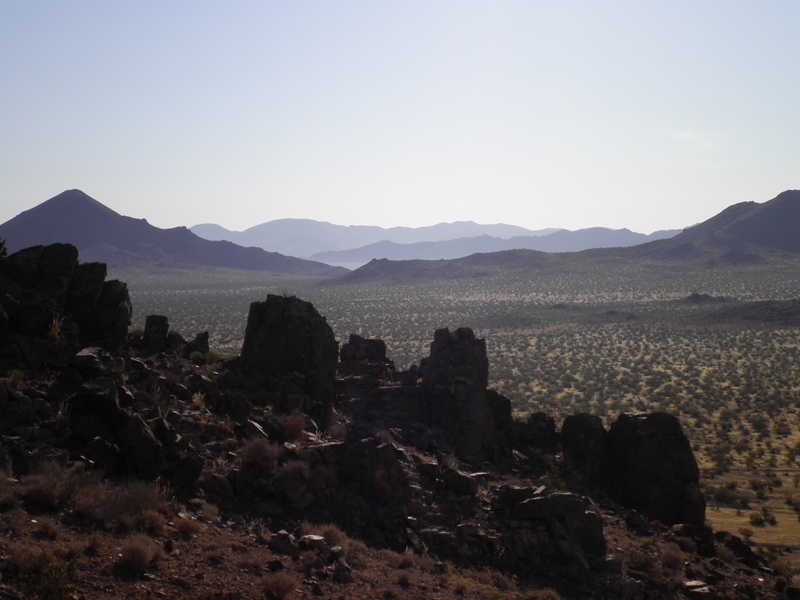 That picture was taken about 85 miles west of Joshua Tree/Twenty-nine Palms. I like your idea tha the answer is already inside us. It’s why I’m trying to do what I can to stir up my heart/mind/soul to see what lies is in the far reaches of my being, because I too believe that the answer is inside us. Sometimes I feel like it couldn’t have actually happened, I must have dreamt it all. Then I remember it was real, the good and the bad. Not sure it will ever make sense. Writing and talking about it certainly helps. Dare I say, “Time for another book, Pat”? Books we write just because we’re ready to write them often lead us totally unintentionally to paths we ourselves can take, and we end up imitating our characters. Art imitates life, and then life imitates art, back and forth, back and forth. Why not give it a go, anyway? Yes, dare. It’s a good suggestion. I really should write another book or at least finish the one I started a couple of years before his death. Or maybe short stories . . . Figuring out what YOU WANT is indeed the 64,000 $ question. Sounds like a change in your head space may be in the works, as you walk and think. Best wishes for that!